We made the following changes across all our modules in this release. In both Assets and People, under Management, we moved the Save and Discard buttons from the Details sub tabs to the upper right of the main tabs. We also added a small visual indicator to the Details sub tabs to alert you when you have unsaved changes on those tabs. From Spaces, under Setup, you can now assign specific assets to your work spaces. If you don't assign specific assets to a space, it will be available to all your assets. In Fleet, under Setup, you will now see only the assets and installations that are either in your division, or in the divisions below yours. This means you won't be able to manage installations for assets outside your own division. In Reports, we added a new People filter to the People data source. The People filter displays the names of everyone you've added to Helm CONNECT, including users, non-users, and both active and non-active employees. New formatting for the tags and fields in the results of global searches for people (Alt + g) makes them easier to read. Better visual contrast in windows makes it easier to see the difference between the content and the background. For consistency throughout Helm CONNECT, we replaced the term vessel with the term asset. Introducing Helm CONNECT Inventory! Building on the inventory and requisitions features in Helm CONNECT Maintenance, our new Inventory module provides current parts estimates for each of your assets and warehouses, and enables your crew to update those quantities simply by recording the parts they use. 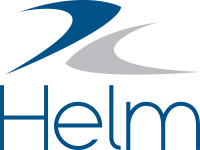 Helm CONNECT Inventory is available now as a pre-release for current subscribers to Helm CONNECT Maintenance. Over the next few releases, we'll be rolling out more features, including component and part transfers, and purchase order tracking. We made the following changes to our Maintenance module in this release. You now have the option to quickly assign an inventory template to "All assets" instead of having to select the name of each asset individually. You can now configure which items are required. By default, all new items you add to a template will be required, but you can change this setting by clicking the Required icon to the right of the item. On the Parts tab, in Parts, under Setup, you can now assign parts to a specific asset type or types. If you don't select an asset type for a particular part, it will be assigned to all asset types by default. You can now add custom fields to part categories. Add new custom fields on the new Part Categories Custom Fields tab in Parts, under Setup, then assign them to parts categories on the Part Categories tab. When you assign a custom field to a part category, it will be available to any parts assigned to that category. If you click the Part Info icon in an inventory count, you'll notice we changed the look of the window that displays. We redesigned the layout of the fields, and included a photo of the part, if you added one during setup. We also displayed the Active and Critical Spare check boxes. If the part you're looking at has any custom fields, you'll see those in this window too, but only if they have data in them. We added two new read-only fields to the Tasks and Corrective Actions windows: Task Type and Source. You can configure whether or not you want to display these fields on the Task Fields Configurations tab in Tasks, under Setup. Note Any configurations you make on the Task Fields Configurations tab will apply to both your Task and Corrective Actions windows. We added two new data sources: Inventory Checklist and Parts. We added a new group of fields related to Parts Used to the Task data source. We added two new fields to both the Task and Corrective Actions data sources: Assignee Division and Asset Division. The Inspection Checklists, Inventory Checklists, Maintenance Checklists, and Forms data sources now include an Overdue field that displays whether or not each displayed checklist is overdue. We made the following changes to our Compliance module in this release. We added a new Requires Acknowledgment check box to the Document Control tab in Documents. This feature allows you to choose the documents you want your crew to acknowledge. On the Library tab in Documents, under Onboard, your crew will see a visual cue that a new document has arrived and requires acknowledgment. They can then click a new Acknowledged button to confirm they've seen the document. On the Document Control tab in Documents, under Compliance, you can check whether or not someone on the asset has acknowledged the document. Note Although you can configure any document to require acknowledgment, only crew using an installation of Helm CONNECT will see the visual cue and be able to acknowledge the document. Crew using the browser-based version of Helm CONNECT won't see the visual cue and won't be able to acknowledge the document. Any documents uploaded to Helm CONNECT can now be printed. However, because of the compliance risks associated with distributing uncontrolled documents, all printed documents include an "Uncontrolled Document" watermark on every page. This watermark can't be edited or removed. We made the following changes to our Jobs module in this release. In our previous release, we introduced event-based forms. This powerful feature allows you to configure selected forms to be automatically added to your crews' To Do list when they log specific event types. In this release, for Jobs customers who also subscribe to either Compliance or Forms, we've expanded event-based forms to include job events. If you configure a selected form to be triggered by a job event, it will be automatically added to your crews' To Do list when someone fills in the time for a job event in Logs, or when someone fills in the actual time for a job event in Dispatch. You can now attach files, such as images and documents, to an order. You'll see the new Attachments overlay when you're editing an existing order from either Dispatch or Billing. Changes aren't saved automatically. Instead, once you've made your changes, click the new Save Changes button. The PDF associated with the invoice isn't updated automatically. Instead, once you've saved your changes, click Update PDF. In the previous release, you could only edit the Transaction Date and Transaction Note fields on an unsubmitted invoice. Now, you can also edit the Customer PO #, Bill To Address, and Email fields. Approve setup and trip requests You can now assign separate permissions to approve setup requests and trip requests. You'll find the new Approve Setup Requests and Approve Trip Requests permissions under Settings > Request Manager > Approve, on the Roles tab, under Setup. Add or edit order templates You can now assign permission to add or edit order templates on the Trips tab. You'll find the new Save As Template permission under Jobs > Dispatch, on the Roles tab, under Setup. Note Remember that permissions are nested. If a role has access to the top level of a permission group, it has access to everything in that group. You can now generate invoices with a total of zero if, for example, you've added a 100 percent discount. However, you can't generate an invoice without any line items. If the Request Manager receives more than one request to update an item, such as ship details or the information about a trip, it will remove the first request and replace it with the second one. Example If one user requests an update to the IMO number for a ship, then a second user also requests an update to the IMO number for the same ship, the first request will be replaced by the second one. Generate billing with a deactivated contract You will see a warning if you try to generate billing with a deactivated contract. You can still generate billing, but this new warning gives you the chance to make sure you haven't selected the wrong contract by mistake. Jobs or trips with negative durations You will see a warning, and won't be able to proceed, if a job end is before a job start, or if a trip end is before a trip start. To ensure you can always see the displayed dates for your trips, we moved the scroll bar from the outside right of the Planner to the inside left. Now when you scroll, the dates are always visible. We also made some significant speed improvements to the Planner. Transaction reports now include reasons for reversals. Resource reports now include resource owner and related company fields, operating areas, and the ship, as well as ship type and ship data. We moved the Styles and Snippets tabs from the Invoicing item on the menu, under Setup, to a new menu item called Reports. On the Styles and Snippets tab, you can now edit the default styles and snippets by selecting the item you want to edit, then clicking the Edit button. We made the following changes to Certifications in this release. If your company subscribes to Compliance or Forms as well as Certifications, you can now configure specific forms to update specific types of certifications. We added a new item called Update Certification to form templates that you can link to existing asset or personnel certification types. When the form is completed, the linked certification will automatically be updated. Example If you require your crew to attend a specific number of man overboard drills each year, you could link a Man Overboard Drill form to a Man Overboard Training certification type. When the form is completed, the linked certification will be renewed for each crew member who attended the drill. Previously, if you needed to make a change to the details about an existing certification, such as the obtained or expiry dates or the reference number, you had to renew the certification. In this release, if you have permission to use the History tabs for Assets and People, you can use the new Edit button to make changes directly to the certification record without having to renew.